View full Your Space Newsletter Archive. 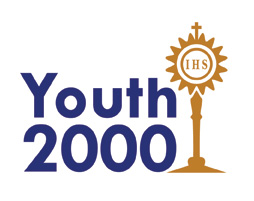 Our Parish Youth 2000 Prayer Group for young people 16-35 years recommences Tuesday 3rd November in St. Declan’s Room, 8-9pm in the Parish Office. Please come and join in this quiet time of prayer in the presence of the Lord. All Welcome. You are invited to participate in talks, group discussion, fun, music and prayer as young people meet to explore their role in the Church. Further Information and Booking Form (PDF Document). Candles float in the pond before the altar. If you like the sound of an opportunity for informal prayer and are aged between 15 and 25yrs then “Come and See” is for you! The first session took place on Thursday 5th March in Ashbourne Church. The dimly lit Church with candles lining the steps of the altar set a welcoming atmosphere into which a small but lovely group of young people arrived. Fr Derek had made a pond in front of the Altar upon which everyone floated candles while quietly praying for their own intentions. Indeed many parishioners will have seen the pond during the following week and wondered what it was for! Quiet music, thought full passages from Scripture and a powerful reflection via a Powerpoint presentation were all part of the half hour. Everyone was given a small prayer “A prayer to the Potter” as they left and were invited to tea or coffee at the Parish Office Building. Feedback from participants is vital in order to help develop a “Come and See” initiative that will reflect what young people themselves would like for their own special time. Short feedback forms were also given to everyone on the night. “A very peaceful time, very relaxing and just nice” was one comment from the night! Keep an eye out for future evenings. We would love to see you there and hear what you have to say. “Come and See”. Be inspired! View full Youth Category Archive.